I’m a yankee, so I’d never seen them or heard of them until I moved here. There are one of the prettier “weeds” for sure. Especially great for anyone who wants to grow passiflora is the cooler zones! Oh my, I never knew that about this pretty little flower, I hope you will have success with it. Thanks. I’m from the North too, I had never seen or heard of it until I moved down here, and even down here I haven’t run into it much. They are pretty though. I saw one in a nursery recently and just passed right by thinking “it’ll never survive here… ” little did I know! I didn’t know there were hardy varieties. Still, zone 7 may be pushing it, huh? Although, they do die back, they are far hardier than their tropical counterparts. Maybe with global warming, in a few years, you’ll be growing it up there. Interesting info. I have never tried to grow these although I do enjoy seeing them when I can. At first I didn’t think the maypop was as showy as grenadillas, etc., but it really does have the classic passiflora look and much hardier too! Thanks for stopping by! and I don’t have enough shade to grow anything shady, even my pineapple sage is shriveling up. I guess we can’t have everything! 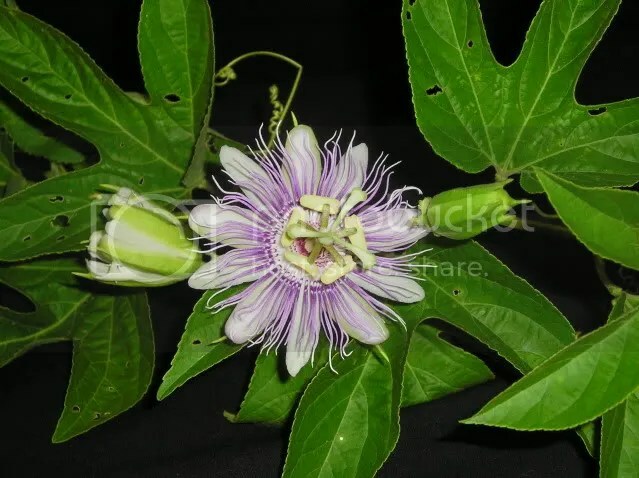 Hi I had a Passiflora, which my late husband bought for me, in the house I used to live in. When I moved I cut it right back, dug it up and brought it with me to the new house. For 2 years it didnt respond at all, I thought I had lost it, but last year it grew better than ever. This year it is even more magnificent with more flowers than ever before. It s in full son most of the day. What a wonderful story! I’m so glad it’s thriving again! Beautiful!